Last month I stopped by the MAC x Star Trek Preview at Comic-Con. The collection officially launches this month and is currently available online at MAC and Nordstrom but was available for early access to anyone in the San Diego area during the week of Comic-Con. I am not one who has followed Star Trek very closely and have never attended Comic-Con even though it is in my hometown, but I could not pass up the opportunity to see something MAC-related and was curious to see what the Star Trek collection looked like so I took an Uber for the first time in San Diego (second time I’ve used it ever!) to downtown since I knew finding parking on my own would be virtually impossible (or extremely expensive). The MAC x Star Trek Preview was held a few blocks away from the San Diego Convention Center where Comic-Con is actually held. They had a space ship station setup with areas for makeup testing, makeup application and checkout. Everything was decked out in a Star Trek theme. You can see more from the event on Star Trek’s website. Up first are the Trip the Light Fantastic Powders which are swirled highlighters. MAC describes these as sheer powders but I find that the color can be built for more pigment. I don’t really find them sheer but you can blend the colors for a more sheer look. Luna Luster is a pale opal rose with tiny flecks of silver sparkle (they look like super tiny micro glitters), Strange New Worlds is a warm peachy rose shimmer, Highly Illogical is a mauve plum shimmer. I’ve been a long time fan of MAC Mineralize Finish Powders even though they can be very shimmery, I find these Fantastic Powders to have less frost and more of a softer sheen. They are still on the shimmery side though. My favorite is Strange New Worlds for the most natural sheen. The other two are more shimmery and have more contrast with my skin and work best as a soft highlighter for the cheeks or eyes. Next are two of the Pressed Pigments, both of which are what I’d call glitter bombs. I’ve tried and used MAC Pressed Pigments before so I was aware of how sparkly they might be. I talked myself into being brave with these thinking I could pull them off (at least my version of brave). I cannot. They are simply too sparkly for me, even when pressed lightly over other matte shadows or when layered with other colors. The base colors are gorgeous. Not to worry for me though because I have a friend who is dying to take these off my hands, lol. Once on the lids there is minimal fallout and I will say they last an impressive amount of time. For the lips everything was shimmery or metallic. Most options are for the person who likes super edgy looks. Where No Man Has Gone Before is a gorgeous metallic rose with golden sheen, Llap is a shimmering frosted beige, Pleasure Planet is a very sparkly multi-colored gold with a sheer yellow base. In my experience some MAC frost and shimmers look best with a clear or sheer gloss on top to help tone down the shimmer a bit and bring out the color. I think both of these lipsticks are in that category. 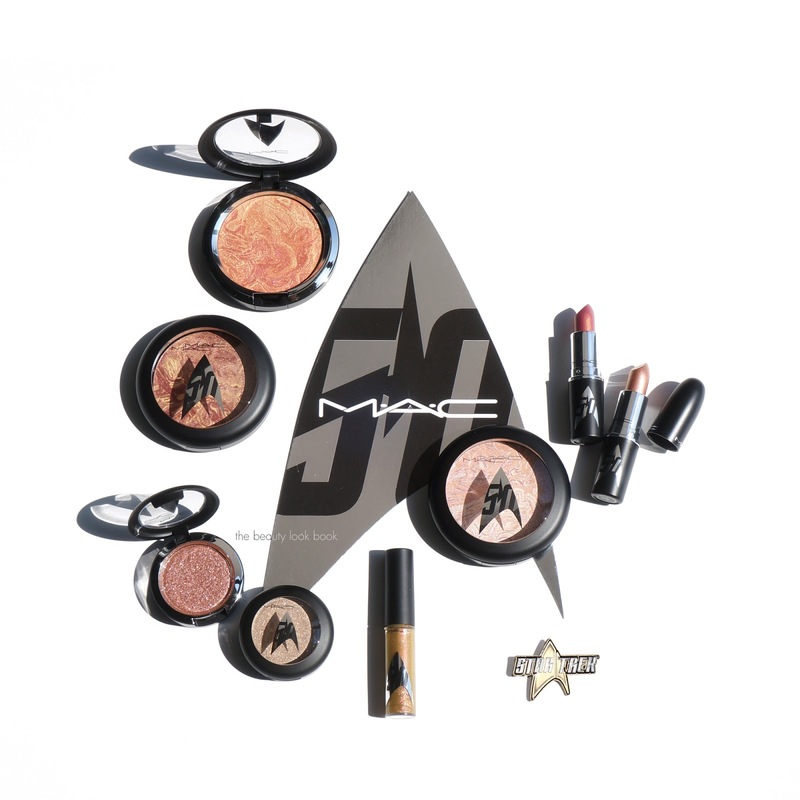 I found the MAC x Star Trek launch to be a fun and innovative collection filled with lots of unique colors and interesting textures for shimmer and glitter. In case you haven’t seen it, Karen at Makeup and Beauty Blog has a really fun series of looks on her blog of the collection. I had a lot of fun visiting the Star Trek setups at Comic-Con, it’s always fun to people watch and the costumes are quite amazing. If I had to pick anything as a must-have, it would be Strange New Worlds Trip the Light Fantastic Powder. The collection is available online and in stores starting today at MAC and Nordstrom as well as all other MAC counters. Everything is limited-edition. Have you checked anything out yet? Or do you have anything on your wishlist?